Underwater photography fun and inspiring. Last year I was lucky to have one of my kayak images published as a cover photo in Sea Kayaker Magazine. Inspired by this success I got an idea of taking under water photos when rolling and playing with my kayak and hopefully have one or two images published. The easiest way to take some UW photos had of course been to buy a watertight adventure camera and get going. But I wanted to have high quality images, to get the quality I wanted I decided to use my Nikon SLR together with a Sigma 10-20mm lens. To find, buy and adjust under water equipment for my purposes turned out to be a small DIY project. I found that a soft UW housing from Ewa-Marine would be perfect. Since I wanted to install my camera on my kayak it was necessary to have a tripod attachment in the UW hosing. Ewa-Marine can install a tripod attachment in their housings as a special option. I got in contact with Ewa-Marine and a Swedish dealer to try to order a housing with tripod attachment. The answers I got were vague. The Swedish dealer told me they couldn't help me. Ewa-Marine advised me to order from a German dealer. And I was told that delivery time for this special order estimated to 8-12 weeks! A metal plate with bolt holes and a tripod tread in the center was manufactured. I bought a quick disconnect camera plate, installed it on the inside of the UW housing. I made holes for the bolts in the plastic bag type UW housing(i guess the warranty went away at this point) and installed the home made plate on the outside of the soft housing. I sealed the plates and bolts with Liquisole (Shoe repair glue), tightened the bolts and nuts and crossed my fingers that it would be watertight! After 24h clue curing I did a test to find out if the UW housing still was watertight. Above: The Cullmann 40450 + 4 screws and nuts and a home made tripod fitting plate. For the kayak I made a simple tripod in wood that I could install at the front end of my kayak. I drilled some holes in the horizontal beam to be able to install a ball head in different locations, I used a cheap Dörr HB-36 ball head for this and it turned out to work just fine! . 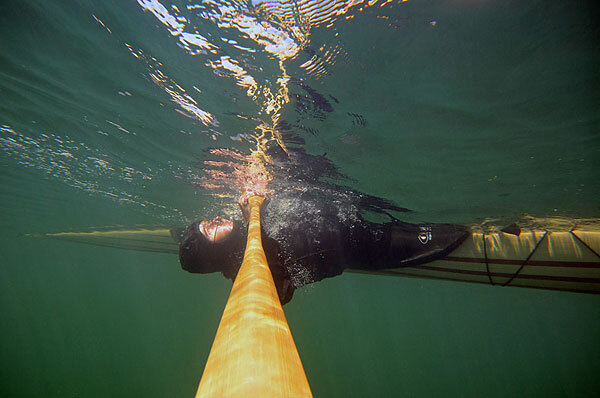 The simple DIY wooden tripod was secured to the kayak with a nylon strap. I bought a radio controlled shutter release to be able to fire the shutter when rolling the kayak. I found it possible to set the shutter release in continuos After pressing the shutter control button a series of five exposures with one second between each exposure were taken. With this setting I could start the camera before capsizing and get some images during each roll. With focus set to manual and setting aperture to 8 or 11 I got sharp images with good depth of field. With the Sigma 10-20mm I was limited to about 12-13mm focal length to avoid image to be cutoff of the UW housing lens port. 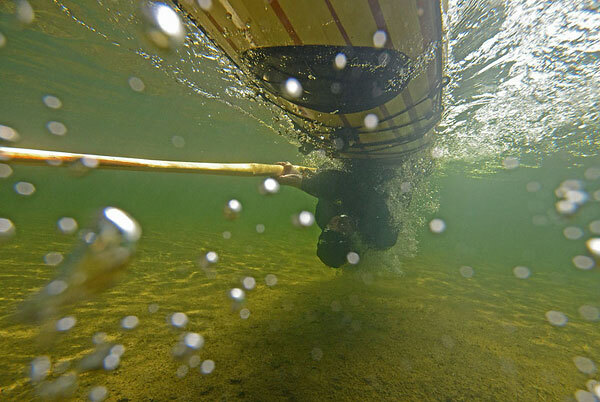 Camera installed on paddle. A hole was drilled in my old paddle to install the ballhead. Camera settings similar to the previous image. The housing is rated to be used to a dive depth of 10 m / 30 ft. The big difference between the U-BF and other housings in the U-B.. Series is the fact, that in addition to the little finger insert to operate the shutter release with the right forefinger, the U-BF comes with a "glove" integrated into the housing. 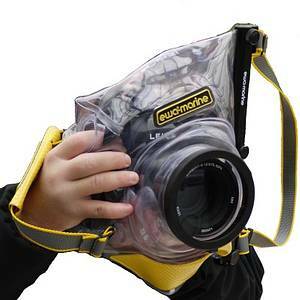 This glove is designed for the left hand of the user and allows him to cradle the camera and lens in his left hand the way he would if using the camera without the housing. Having his hand on the lens then allows him to operate the camera and lens manually and access all the details to allow him to make the photo with the exact settings he desires. The U-BF housing is manufactured from double laminated PVC and has an integrated, optically neutral flat glass port. EWA Marine makes Underwater housings to fit virtually any camera and camcorders on the market from Pro to consumer level and at a price that make it possible for anyone to try and explore UW photography in a fun and safe way. Ewa Marine DSLR UW house reviewed By Leif Karlsson.